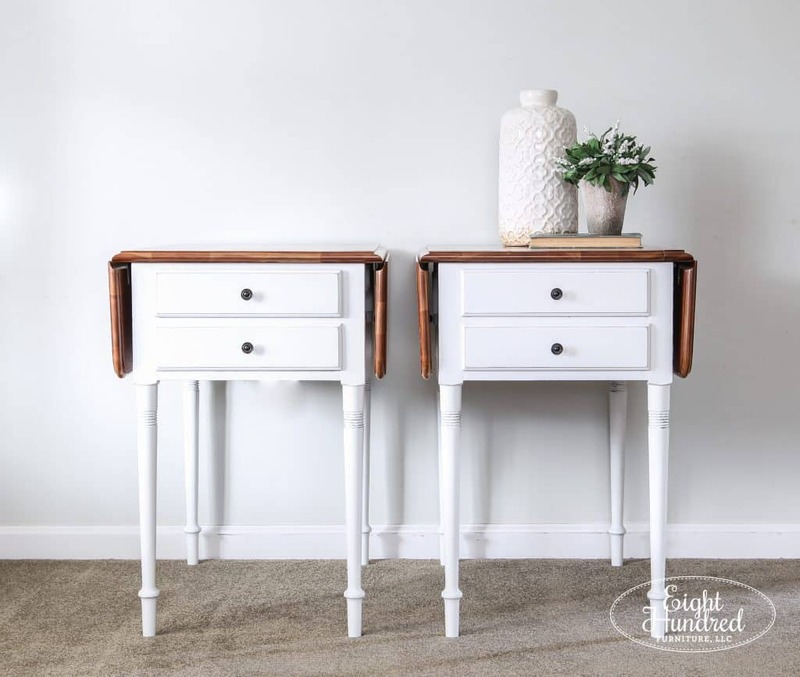 If you’ve been following along with my “Painting With Bright White” series, I’m happy to announce that the cherry end tables I was working on are finally finished! Before I show you the final look, let me remind you where these puppies started. They came to me in their original factory finish. One of the tops had water damage and the finish was definitely worn. 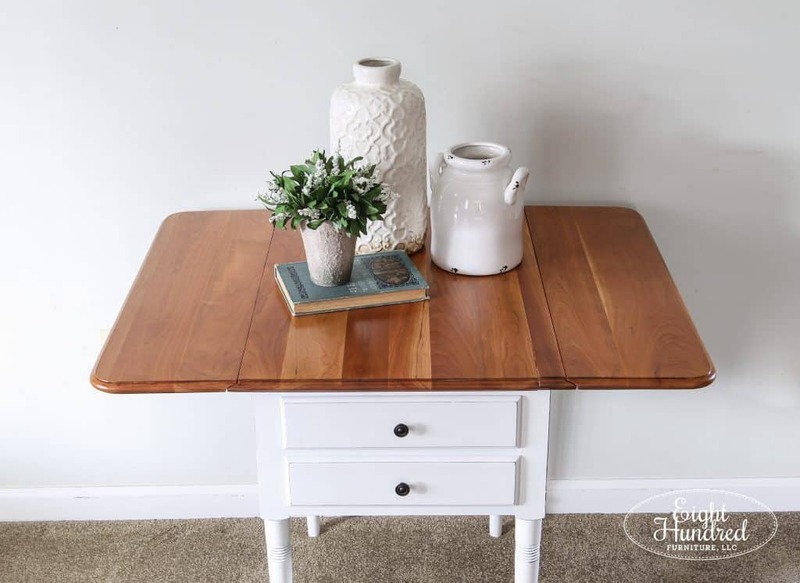 After all the priming, stripping, sanding and troubleshooting, these tables have a brand new look! Guys, they look absolutely incredible! 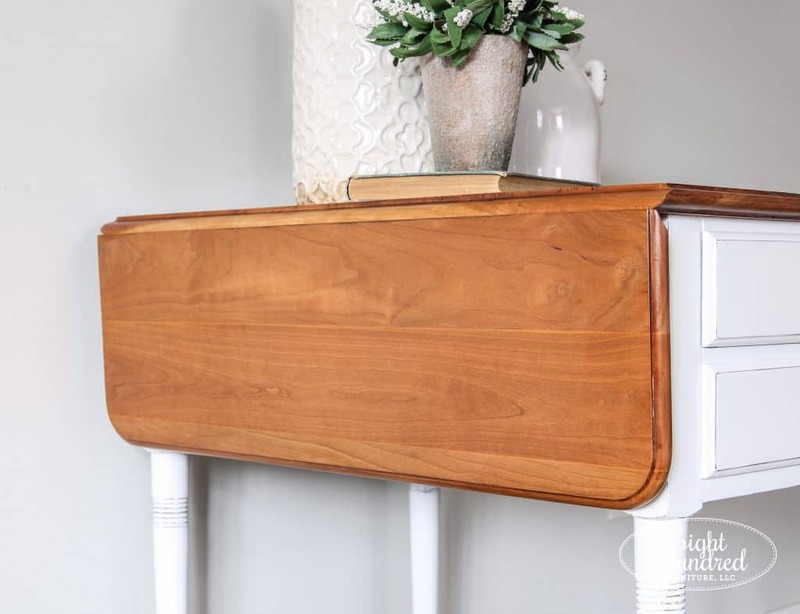 I could drool over these tops all day long. 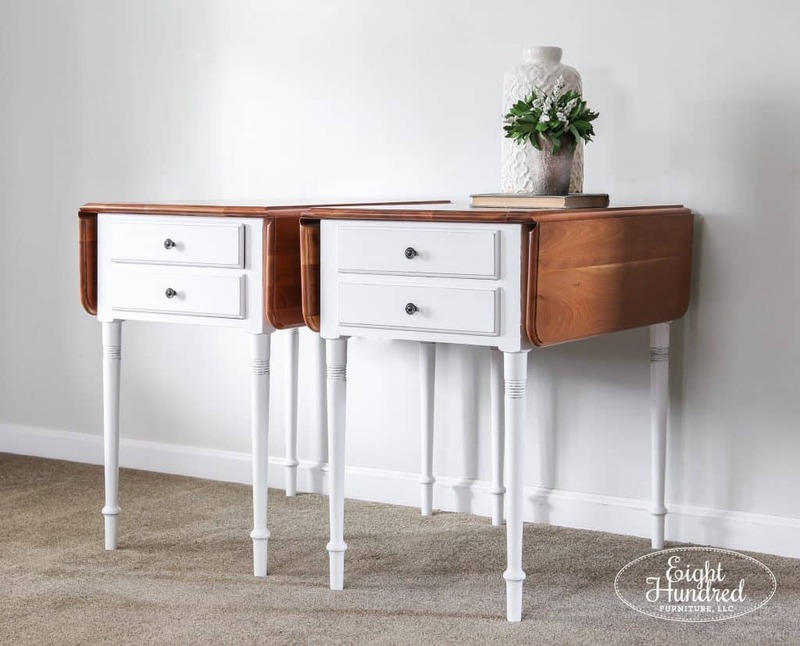 The bodies were primed with General Finishes Stain Blocker and then painted in several coats of Snow White Milk Paint. 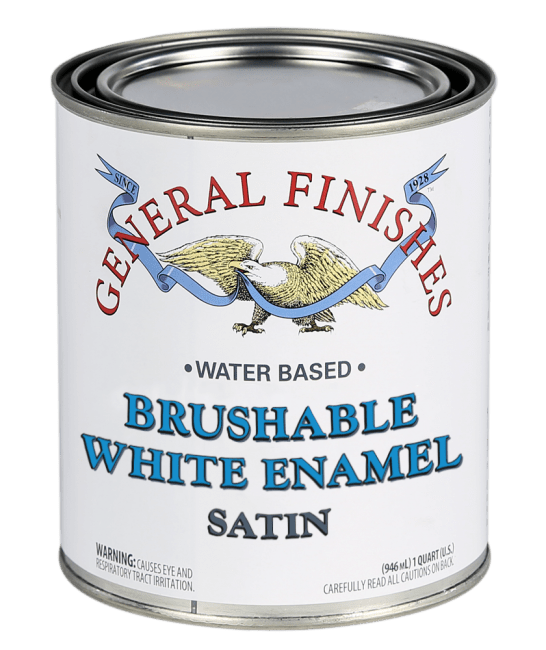 I ran into issues with coverage, so I switched over to General Finishes new Brushable White Enamel. This product is incredible! 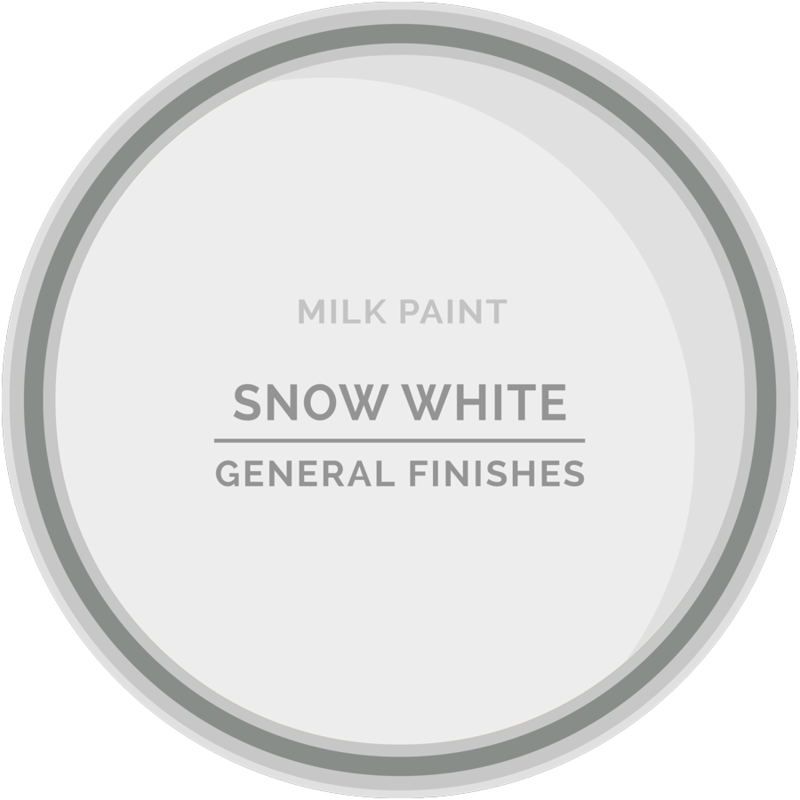 It combines bright white paint with a durable topcoat, providing a 2 in 1 product that’s super convenient! 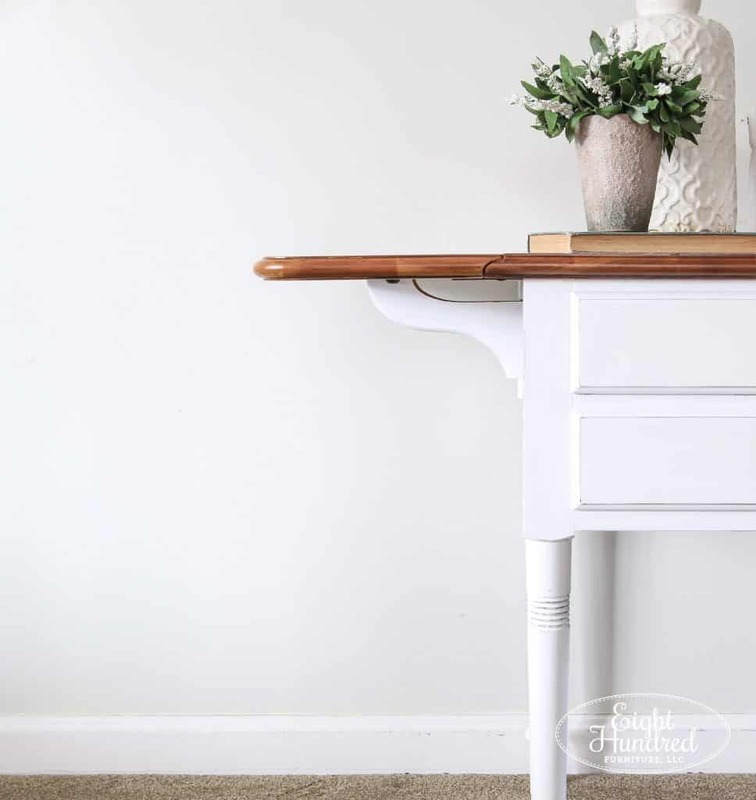 The built in topcoat also helps to prevent yellowing because it’s not being applied separately – it’s part of the paint. 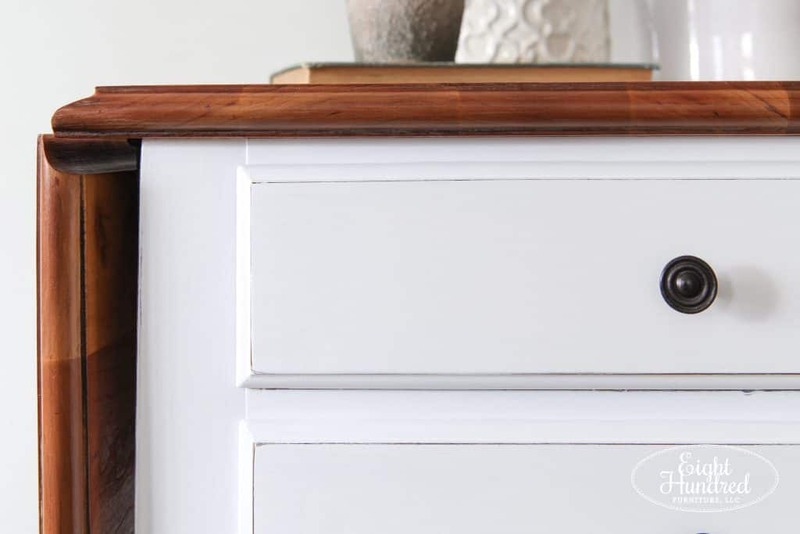 I painted a layer of Dark Chocolate Milk Paint underneath the white paint, so I simply rubbed away the edges of the piece, revealing the brown paint instead of the wood. 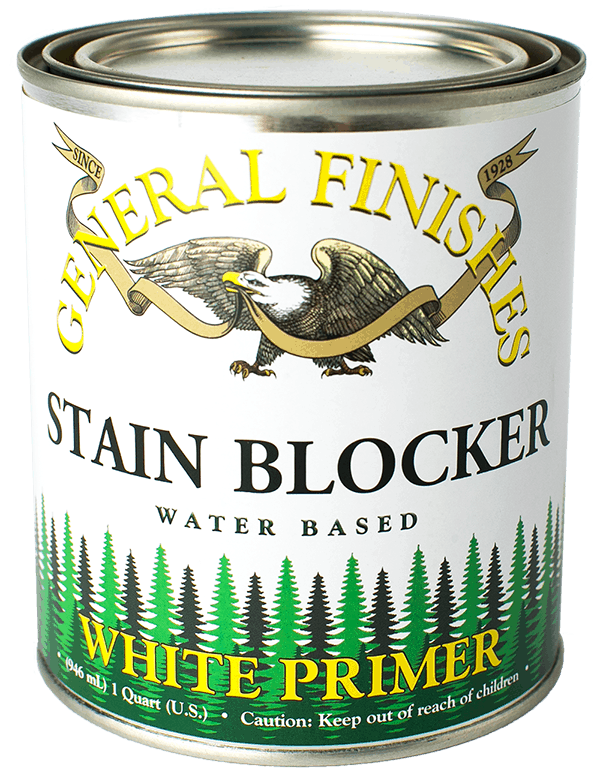 That way, I wouldn’t rub away the primer and the cherry wood finish is still sealed. 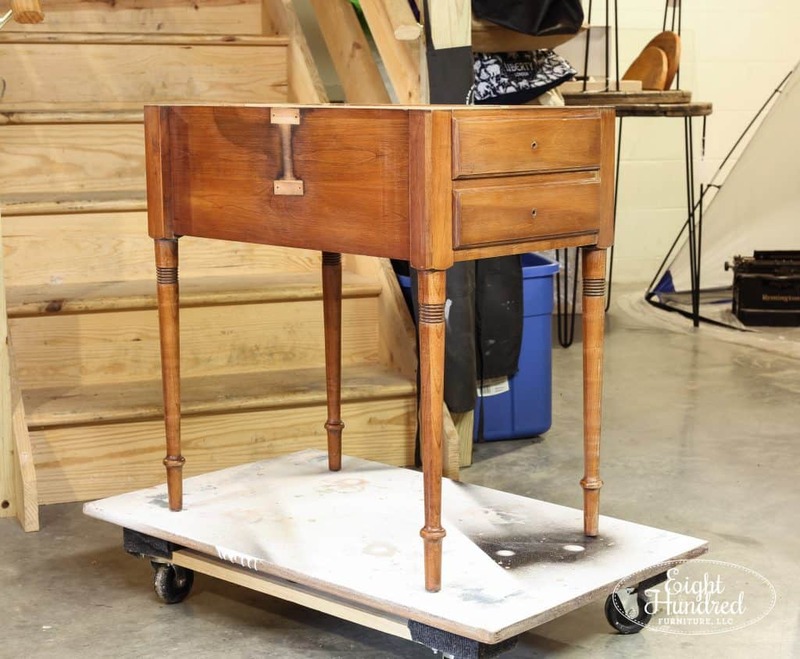 The tops were completely refinished – stripped, sanded and re-stained using New Pine Gel Stain. 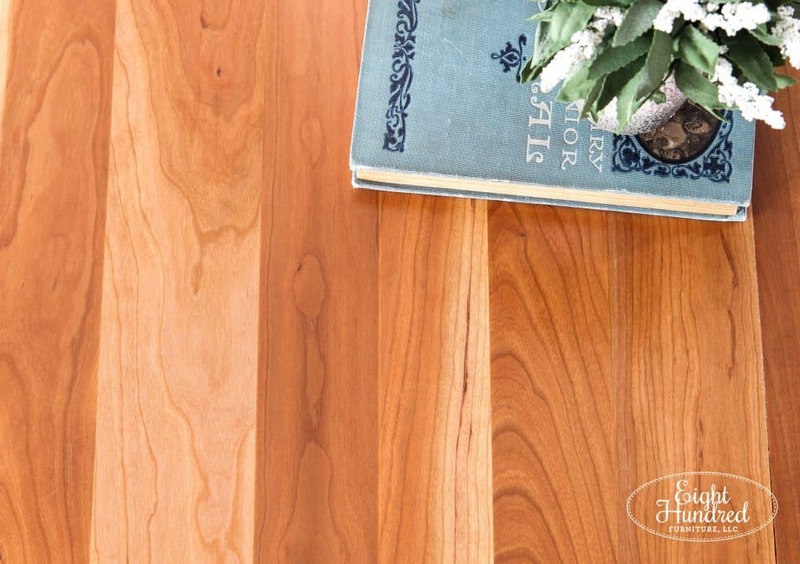 This stain color drew out the variations in the wood tops, creating a gorgeous array of grain patterns and wood tones! Seriously! Look at these grain patterns! 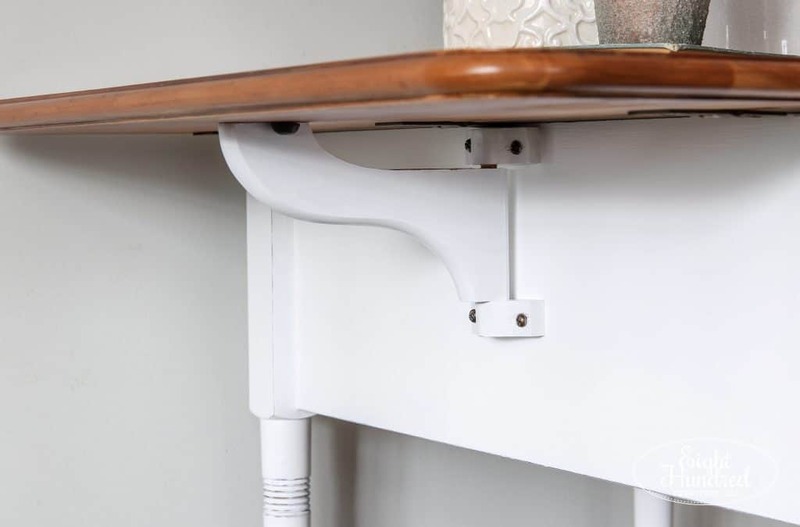 These tables have drop leaves on either side and the cutest little arms underneath. It was a bit tricky taking all of these little pieces apart to prime and paint, but it was worth it to have a cohesive look from the top down. 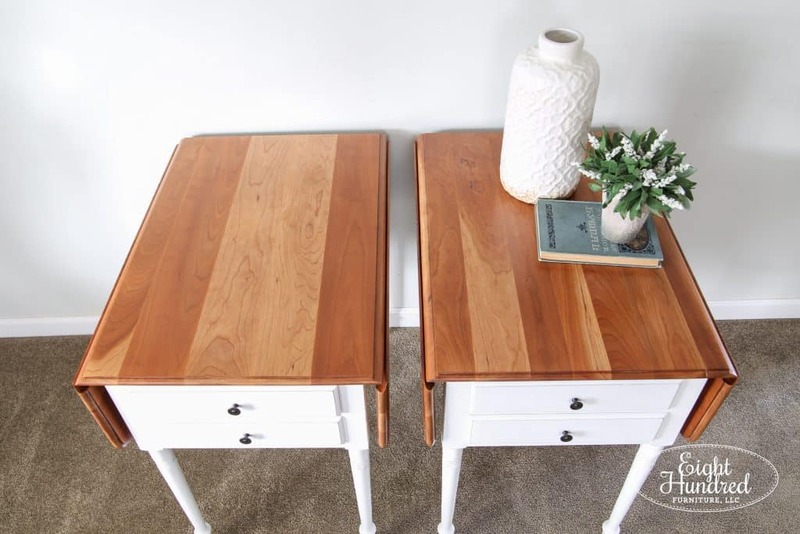 These tables were completed for a wonderful client, and they’ll be going to her beach home. I think the sandy colored tops and the fresh white bases will look incredible in that setting, don’t you? 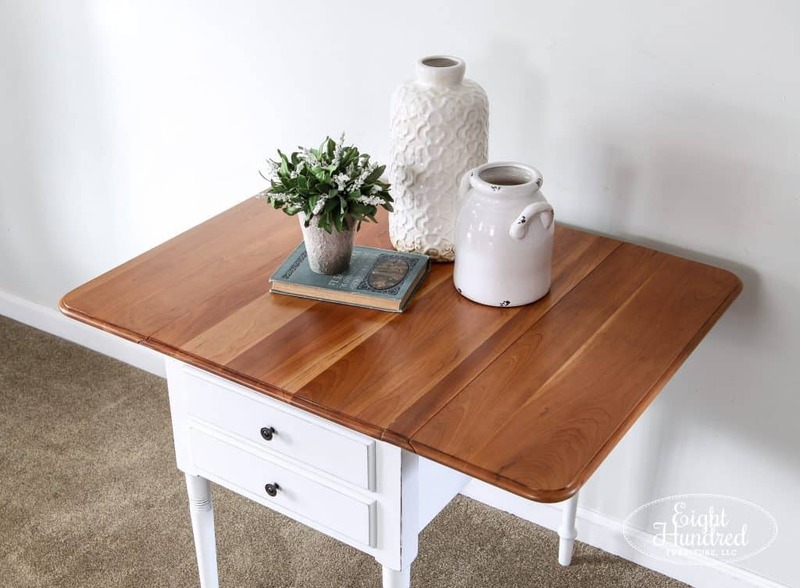 To protect the freshly refinished wood tops, I applied three coats of General Finishes High Performance Topcoat in Satin. 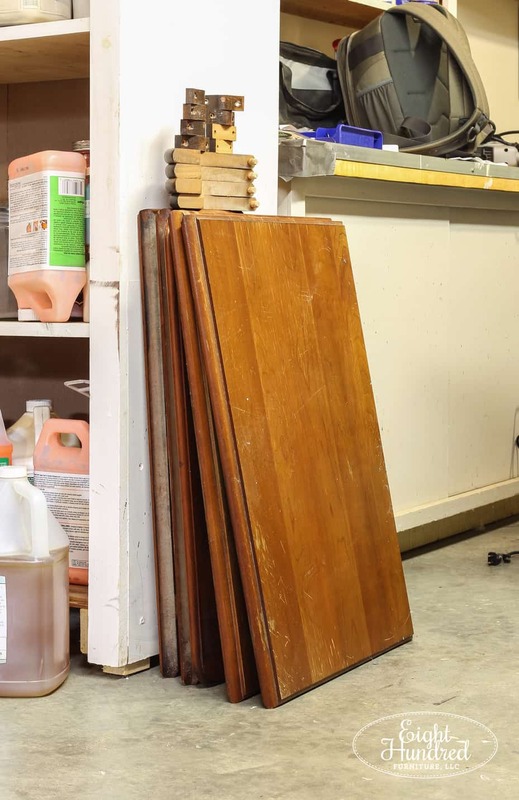 This will provide a super durable finish for years to come. And guess what? No water damage anymore! 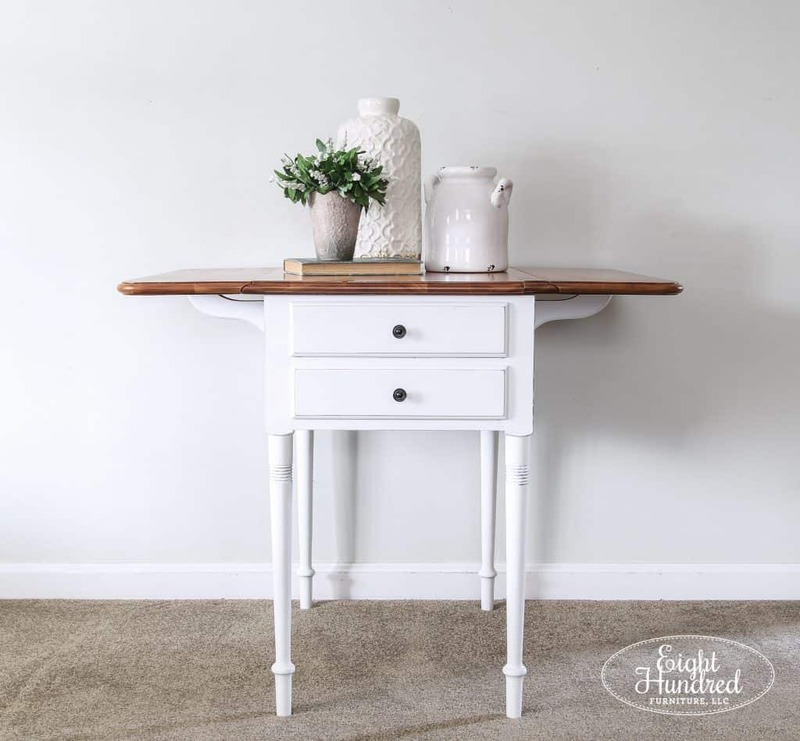 I carry all of the products that I used for this makeover in my retail spaces at Morgantown Market and Homestead Studios if you’d like to replicate this look on a piece of your own. 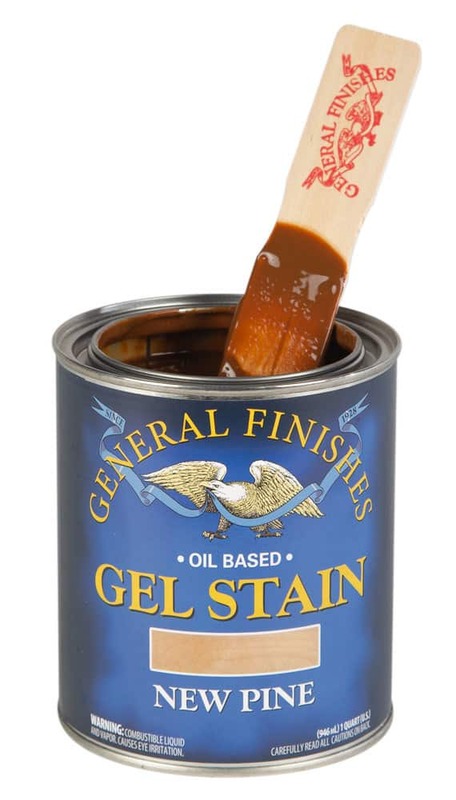 General Finishes carries a wide range of Gel Stains, so if you’d like another color besides New Pine, I can order it for you. 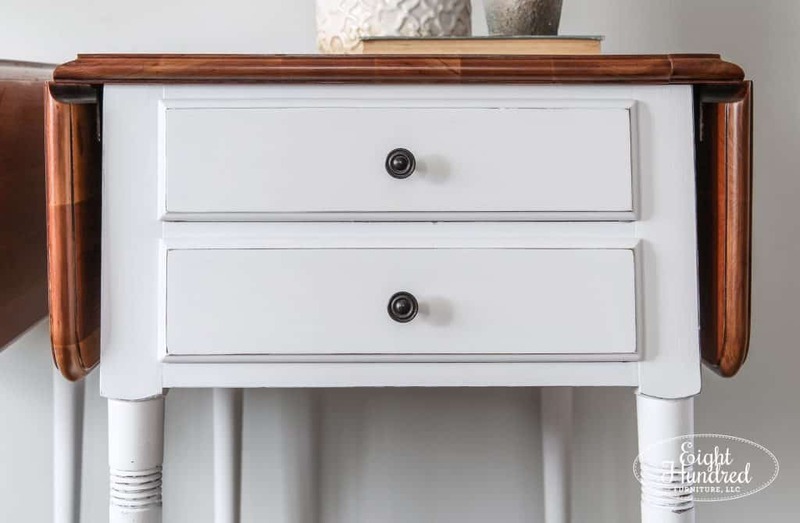 Brushable White Enamel can also be tinted to any neutral shade if you don’t prefer bright white. For now, these cutie pies are getting delivered on Thursday and I’m so glad that my client is in love with them all over again!